Living things seem mighty recalcitrant when it comes to supporting evolutionary conjectures, including those things termed living fossils. Those are things that were thought to be extinct, then found alive and essentially unchanged after millions of alleged years. A green alga, a seaweed, is not quite a living fossil because it was thought to be extinct in North America but still living in other parts of the world. 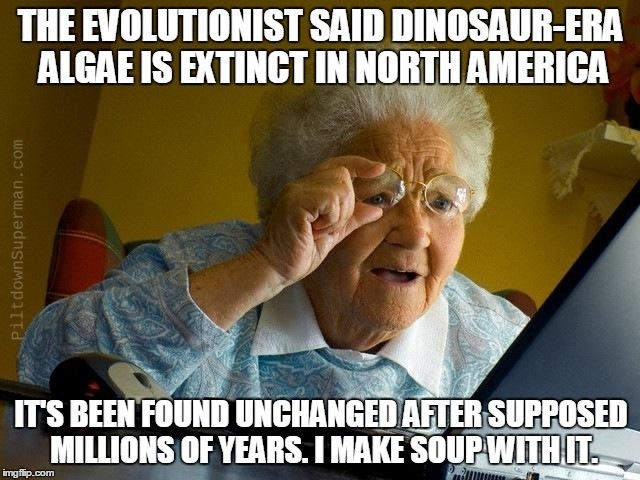 Well, it's been found in North America after all, and it's unchanged. In cases like this, wait for Darwin's Drones to bring out the usual boilerplate excuses: it didn't have to evolve, stasis, and things like that. This child doesn't fall for those tricks, because a lot of environmental things happen in a year, and evolutionary mythology breaks down if they think we're going to accept such "explanations". Aside from the anticipated excuses, there are several important facts that evolutionists overlook, including how critters and plants did not evolve, they were created to survive — and adapt when necessary. To chew on the rest (won't take long, it's not a huge article), click on "Dinosaur Algae Alive and Well Today". For a related article, read "Seaweed Clogs Evolutionary Propellers".